Once settled into our new home, a home with a view I might add, we set out in search of some petroglyphs aka rock art. After a little research, I knew just where to go. 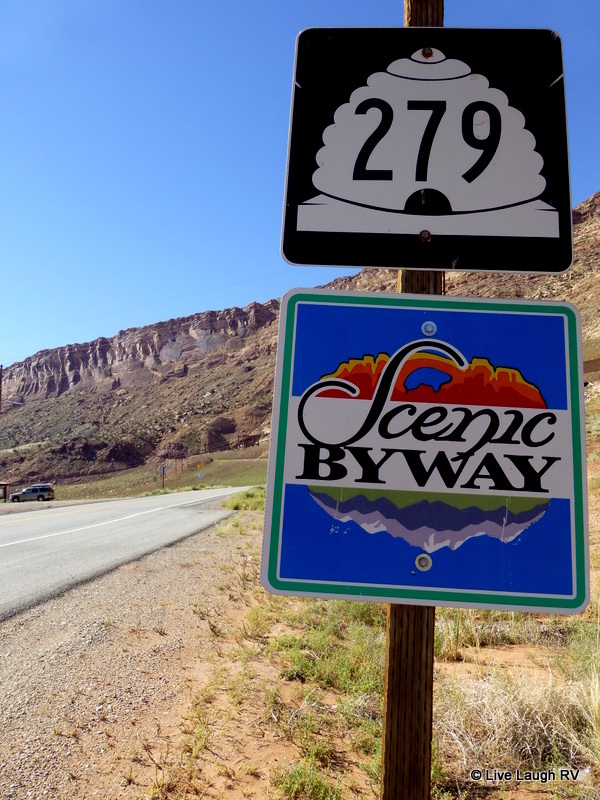 From our home located off Highway 191 we headed south and picked up Utah highway 279. Utah road 279 located several miles north of Moab is a paved two lane road that meanders along the Colorado River and is a popular place with rafters, canoeists, and kayakers . 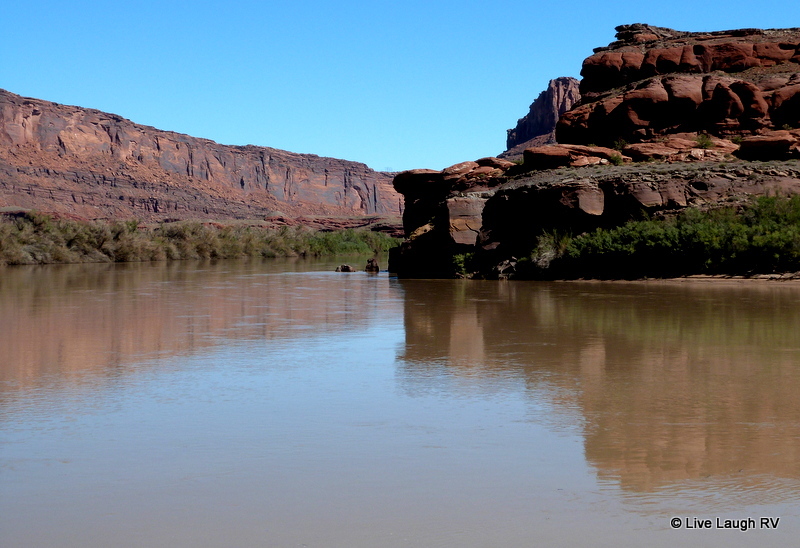 There’s numerous places to access the river as well as a few designated campsites. 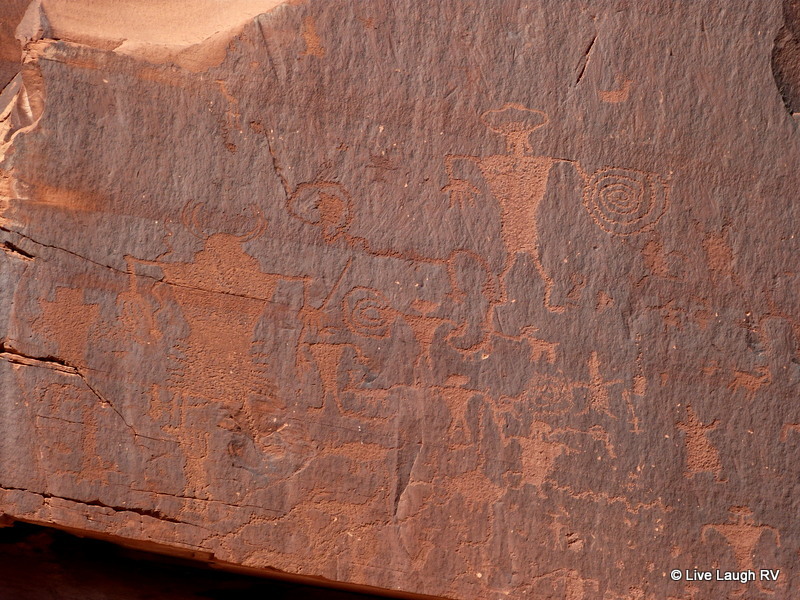 The hunt for these petroglyphs or rather referred to as Indian writing and also known as rock art is an easy search. There are actually a couple of brown signs near pull-outs that say “Indian writing”. 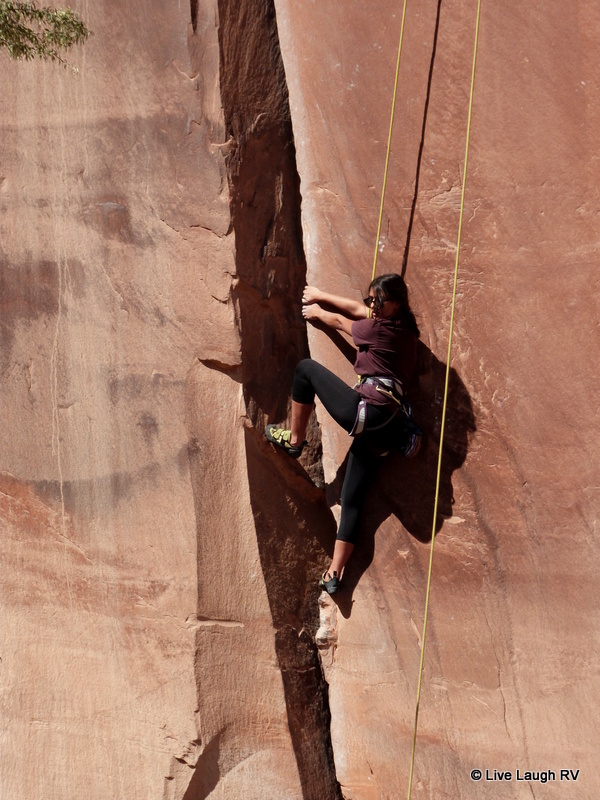 We continued down Utah road 279 also known as Potash Road and stopped to observe some rock climbers. Ah, to be young again. However, even twenty some years ago I would’ve viewed the climbing part as perhaps a little too much work, but repelling? Now that’s fun and I would still consider doing that today…..just beam me up Scottie and I’ll repel down. We continued down Utah road 279 but not without getting side tracked with a gravel road that shot off to the west. A little four-wheeling in the back country found us surrounded by huge majestic rock cliffs that left us admiring their beauty in awe. In the above photo, can you see little ole me climbing up the hill with camera in hand? Look at the size of those boulders. I wouldn’t want one of those tumbling down towards me. Had we taken a map with us, we may have explored this back country road a little more, but the further in we drove the worse the road conditions got. No map and a worsening road had us turning around. We returned back to paved road 279. Shortly after this slight back country road diversion and back on 279, the pavement ended near a large boat ramp. This was the perfect place for our picnic lunch. 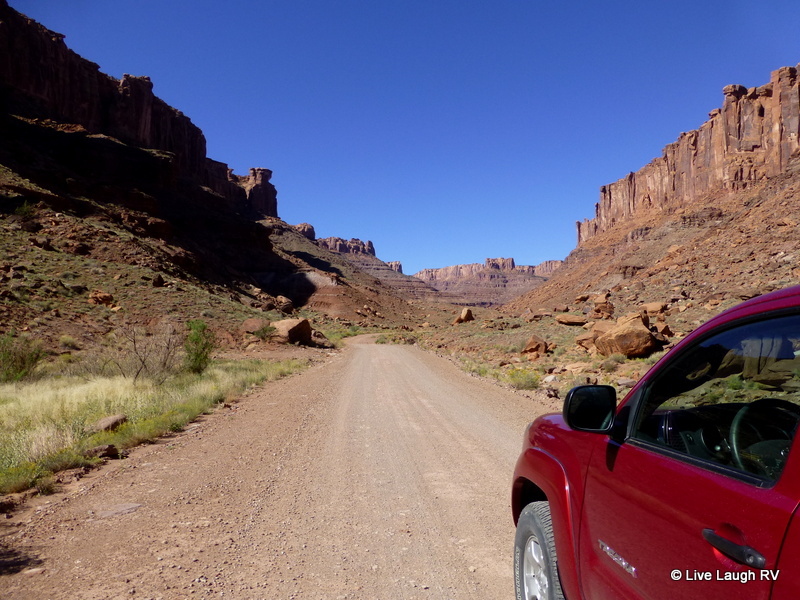 Beyond this point, folks with Jeeps or bicycles access Shafer Road; a gravel road leading up to Canyonlands. High clearance vehicles are a must as well as a sense of adventure. Across from our picnic area was the Intrepid Potash Plant. I’ll share more about Potash in my next post. For now it’s time to return to camp. But before returning to camp, we needed to stop at Lion’s Park located at the intersection of Roads 191 and 128 in Moab to fill up our five gallon jugs with water. Remember our day from hell……you know the day we blew a tire? Well, that blown tire damaged our water lines. We all know what a precious commodity water is especially when boondocking (dry camping). Every time we turned on the water pump, we’d lose some water on the ground through the sliced line, thus we found ourselves going through water a lot quicker than normal even with our MacGyver patch. Our home with a view for a week. 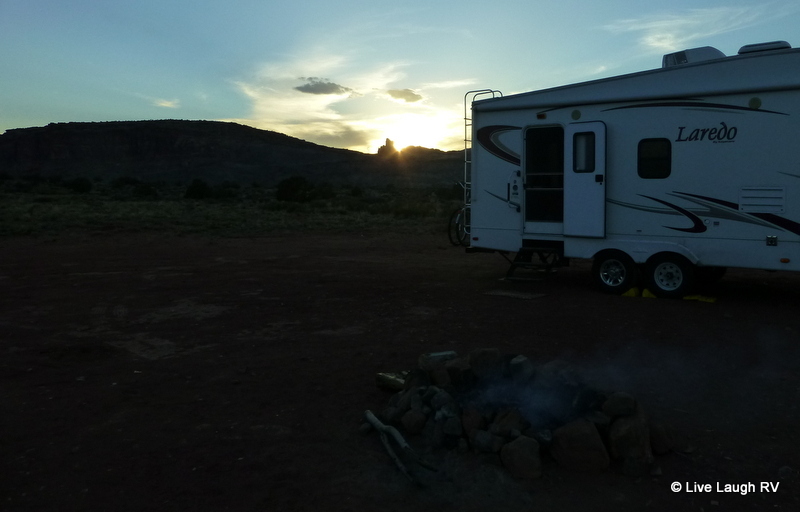 Boondocking north of Moab, Utah – Where’s my hook-ups? With jugs filled, we returned to camp where Al preceded to fill our RV tank with fresh water. Being self-sufficient in this lifestyle is a must and having a MacGyver for a husband is a big plus. It’s interesting how all winter long we stayed in RV Parks with hook-ups with a plan to spend most of April boondocking. 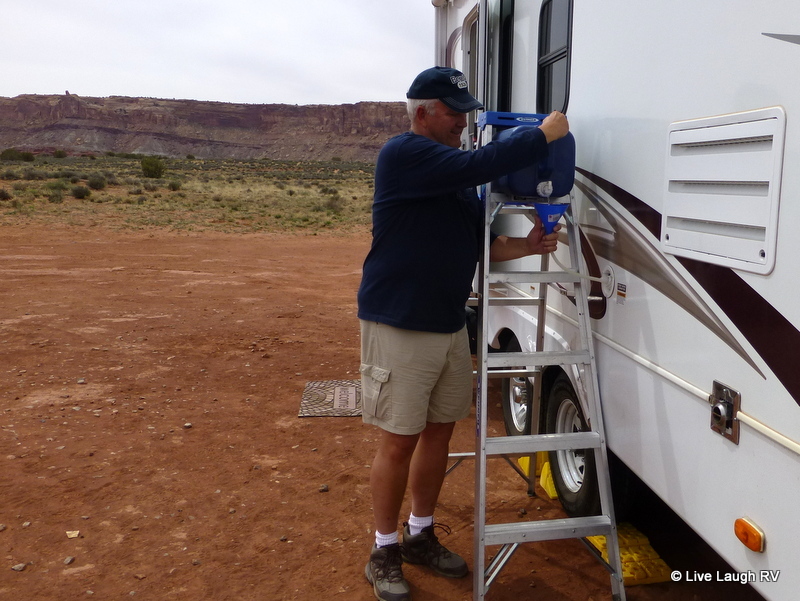 As luck would have it, we damaged the water lines just as we were entering our boondocking phase of the journey, which required us to travel through some pretty remote parts of Utah. Al’s nifty little rig up…..notice my lovely tape job on the wheel fender that got damaged from the blown tire – we’re a class act! 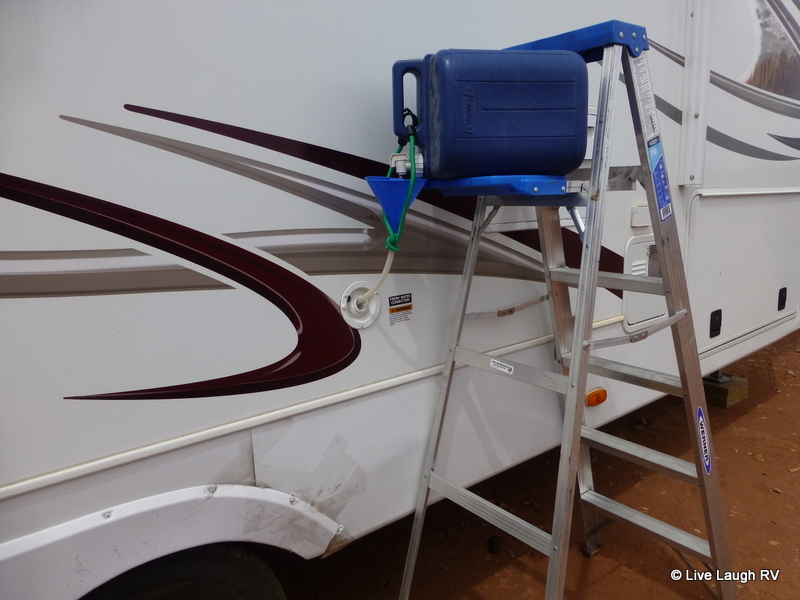 Unable to find the ‘right’ parts to fix the water lines properly, MacGyver aka Al used some tape to stem the loss of water and with a little more conservation on my part, we managed to still enjoy our boondocking. Yep, it’s good to have a MacGyver around. Once we get to a bigger town, we’ll getter all fixed up. Brought back some great memories, sure is nice to have a handy guy around isn’t it. In this lifestyle I’d say it’s a necessity that someone be handy. Hubby and I each have our ‘talents’ which seems to work well. Why, that looks like quite a proper fender fix to me — you used clear tape. Those types of fixes look more Beverly Hillbilly when they’re made with gray duct tape. 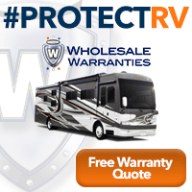 I guess you don’t own all the products listed at the end of the entry, but do you own the RV bible? I want to do more reading about choosing and RV. 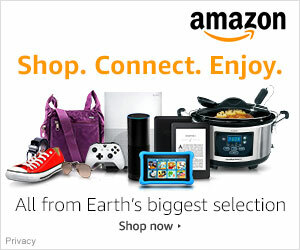 Most of the products I post, we either own ourselves or have heard good things about. The RV Bible is one we don’t own partly because we didn’t need info on choosing a RV. For us it was pretty easy since we already owned the truck, but for folks just starting to look it might provide helpful insight. If you ever have any questions, feel free to email me. I’m always willing to offer my two cents. And trust me, duct tape was an option regarding that repair…..now if only I looked like Elly Mae! BREATHTAKING Captures:) Nothing better than having a MacGyver on board! Thanks Renee. Yep, I’ve often wondered how we would handle some of these repairs if neither one of us were handy or inventive! You have such an eye for photos! Nice MacGyver work there making due with the broken water line. What beautiful photography, thanks for sharing ! Love your photos, Nice work. The West of US is looking like a huge museum under the open sky. Incredible. “Just?” another day in the life of an RV’er. More like another awesome day in the awesome life of an RV’er. Look at all those majestic views! I am green with envy. I wonder if those are the same rocks (the picture with a mini-you) that Luann once posted. If not, they look really the same. I’m sure LuAnn and I have been to a lot of the same places. Unfortunately, not together with the exception of meeting last year in Phoenix. Hopefully we’ll find another opportunity to meet up. Yep, tape sure comes in handy, thank goodness. 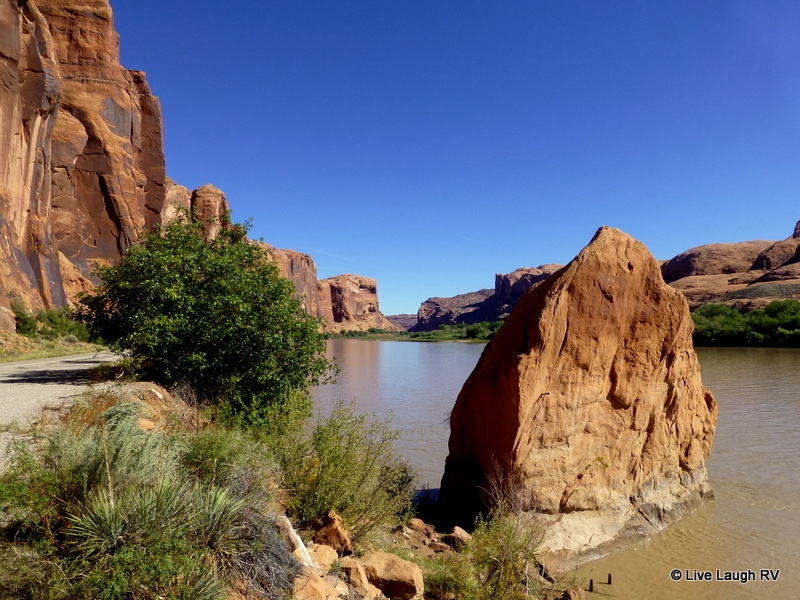 Utah awaits you Rommel…..you could go crazy with your camera! The scenery is magnificent, and MacGyver for a hubby, fantastic! Mine is a MacGyver too. I have been to those rock arts also and could have spent hours if my DW did not make me leave. Have been to several rock art locations and am just fascinated with the spirals. To think about using just rocks and making some of the spirals so perfectly. Plus around the world spirals seem to exist in most rock art – just strange. I too am married to a MacGyver. He has saved us many times and a lot of money to boot! I had forgotten about the TV show and now it’s in my Netflix queue. Fabulous photos of the area. Do you have solar or do you use a generator when you’re boondocking? Having a “MacGyver” of my own, I tend to rely on him a little too much. I don’t know what I would do without him!! Us girls who are in the Mrs. MacGyver category probably should give a few more “atta boy!s”, and not just assume they will come through. Patent that ladder deal, Al….and chive on! Thanks for the back roads scenery as we stayed on pavement during our trip there. Always good to have a little MacGyver in you. Oh yes, we must be resourceful in this lifestyle! We have a similar water filling scenario when we’re camped without hookups — but it’s because our fresh water tank holds only 30 gallons. ;-( Your boon docking site looks fabulous! Ours normally holds 50 but with the steady loss….. 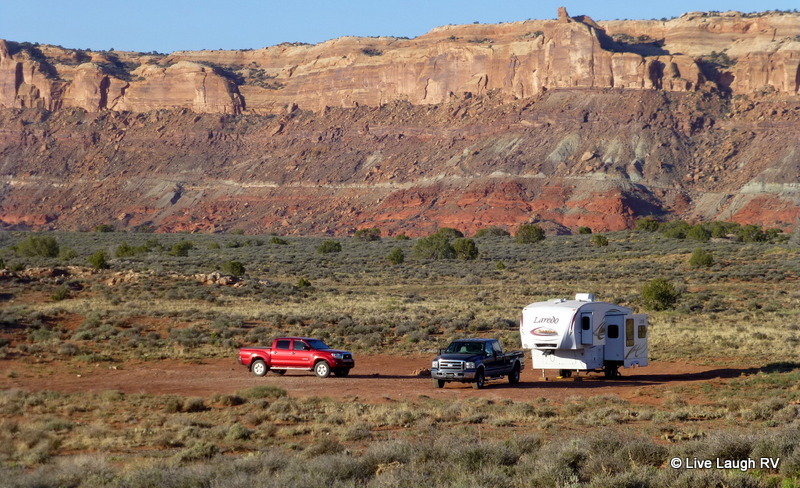 The wide open spaces, amazing scenery, and freedom are well worth a few inconveniences. And yes it was definitely a sweet spot we hope will be available in the future, because we’ll definitely be back 🙂 BTW – like your new gravatar! 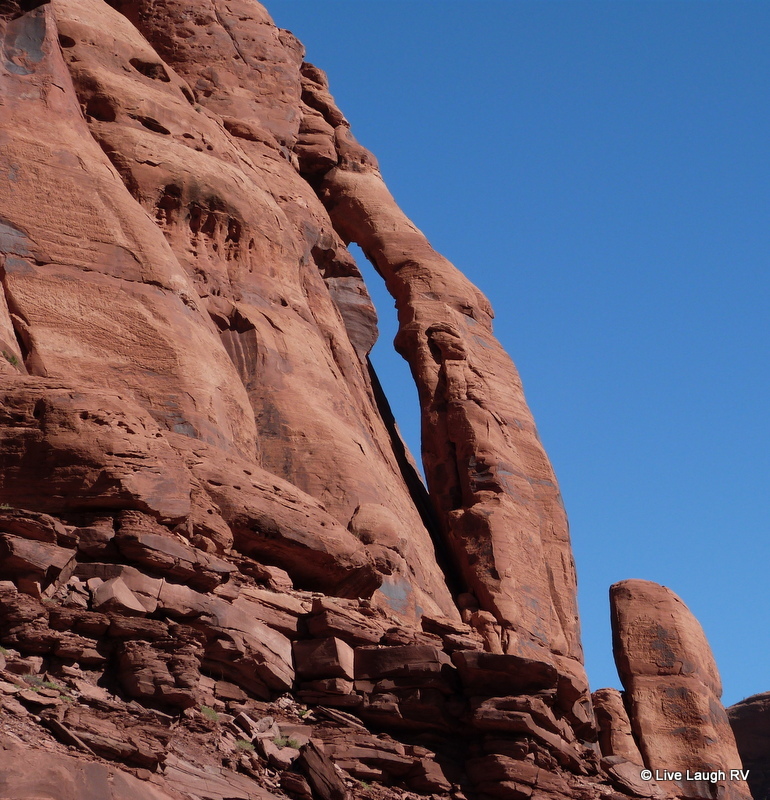 When it comes to landscape shots, I think there is little more striking than red rocks against an azure sky. Your images are lovely Ingrid. We can’t wait to get out to Utah! I love Utah too. Right now we’re in Virgin, near Zion NP. 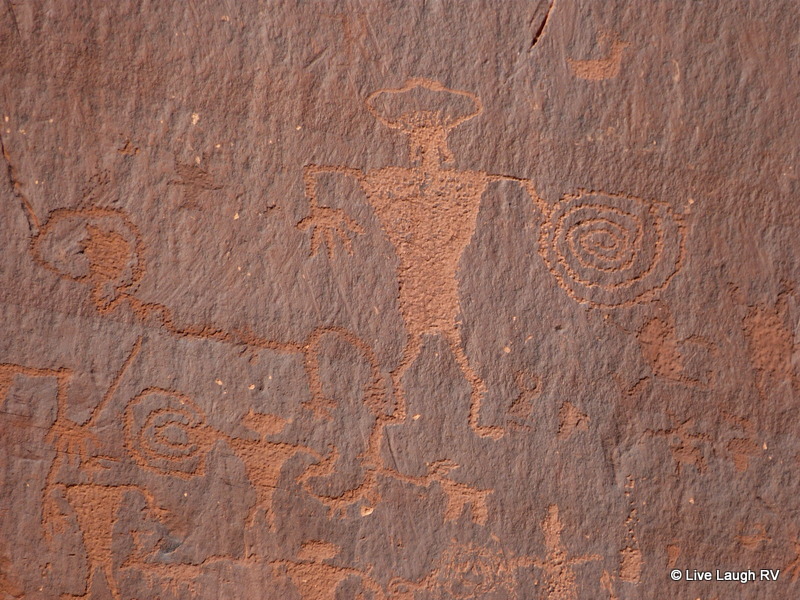 Since you like petroglyphs, while in Moab be sure to see Newspaper Rock on Scenic Rt. 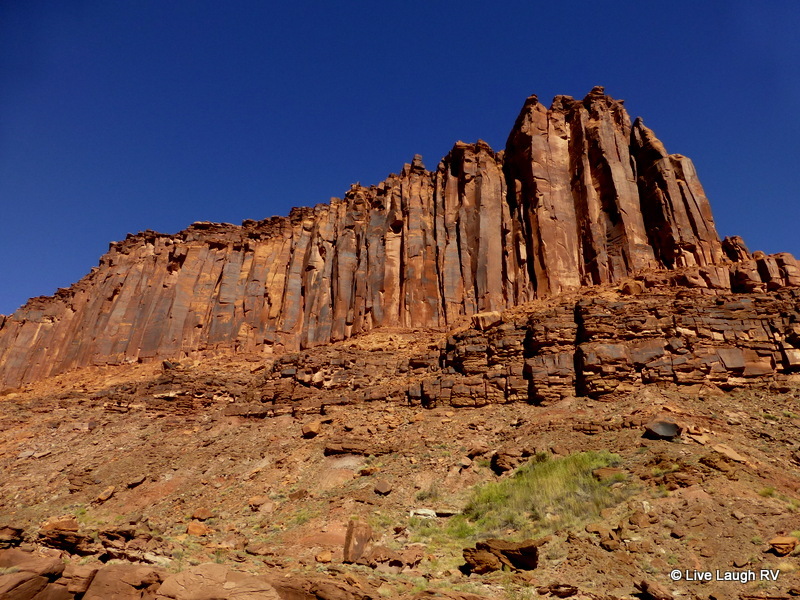 211 in the southern district of Canyonlands. 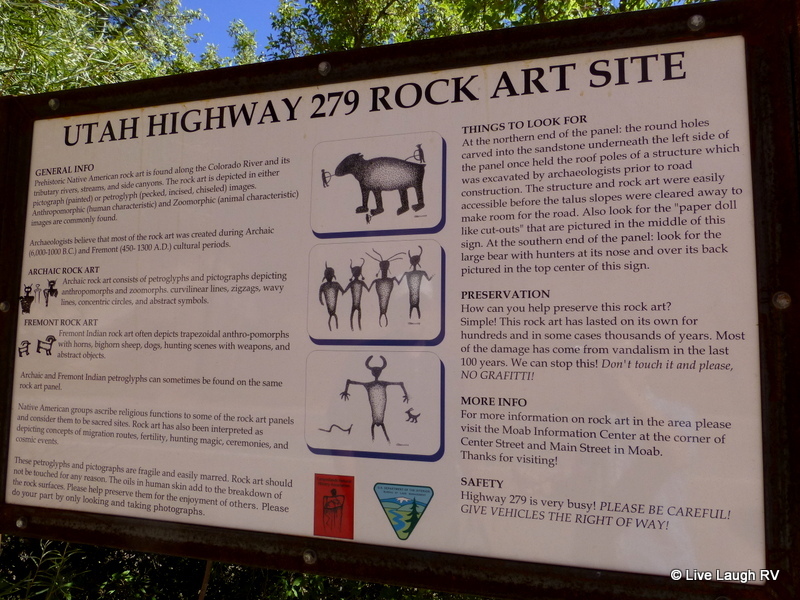 It’s a beautiful drive and a huge collection of petroglyphs. And then further on there are some pictographs at Cave Springs – also beautiful. Another great bunch of pics. Utah does look like a really neat place to see. Can’t wait. Keep filling us in on the lovely places to stay and things to do. So glad despite it all…Boondocking is center stage and such a beautiful place! One day, I’ll be sitting there. Ps…Hope you win the photo contest! Aah the stunning shots of sceneries just kept coming and still jealous. Being creative coupled with a handy man makes this lifestyle a little easier to handle when mishaps happen. Great Job, Mr and Mrs MacGyver. 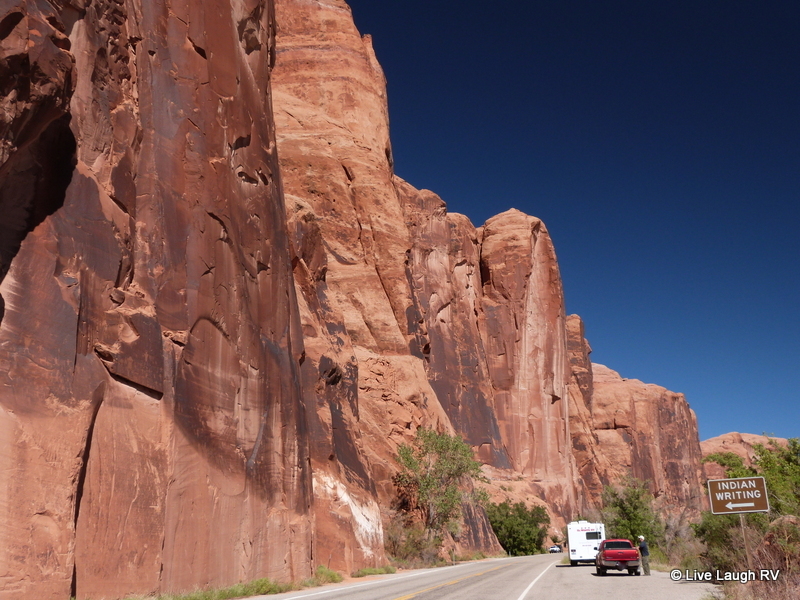 We drove through Moab on 191 a few years ago — next time we’re in along that way, we’ll take the 279 spur road. 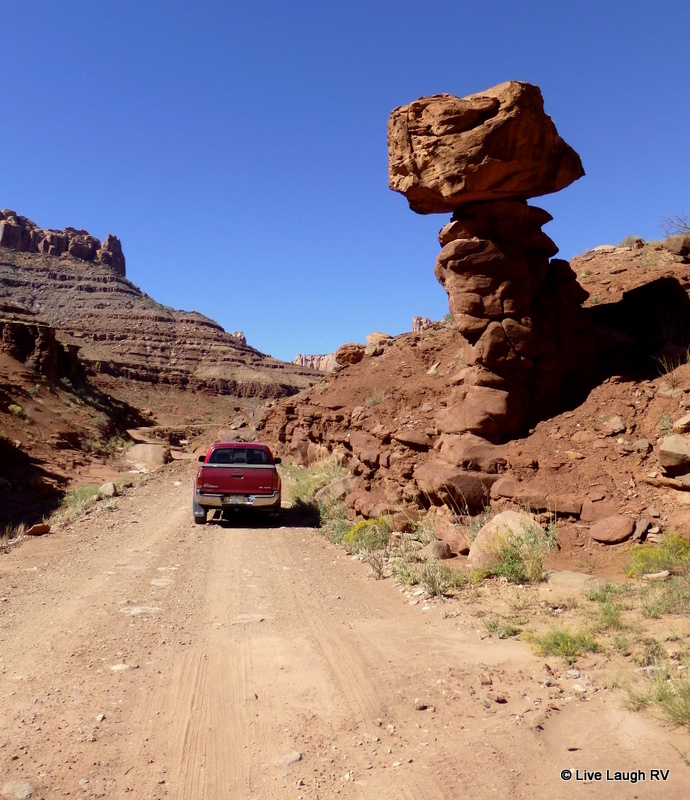 Looks like Moab might be a good place to park awhile and explore! Thanks for reminding me there’s so much more out there OUTSIDE of the national parks!! Travel safe! Utah looks so beautiful! Kudos on the work arounds….sorry you hare having to deal with that. Looks like you’re MacGyver knows what he’s doing! Definitely put Utah on your list and yes being handy is a must in this lifestyle. You’ll find living in a moving home jars things up quite a bit requiring fixes here and there. Thanks for more memories! We watched the climbers for hours. 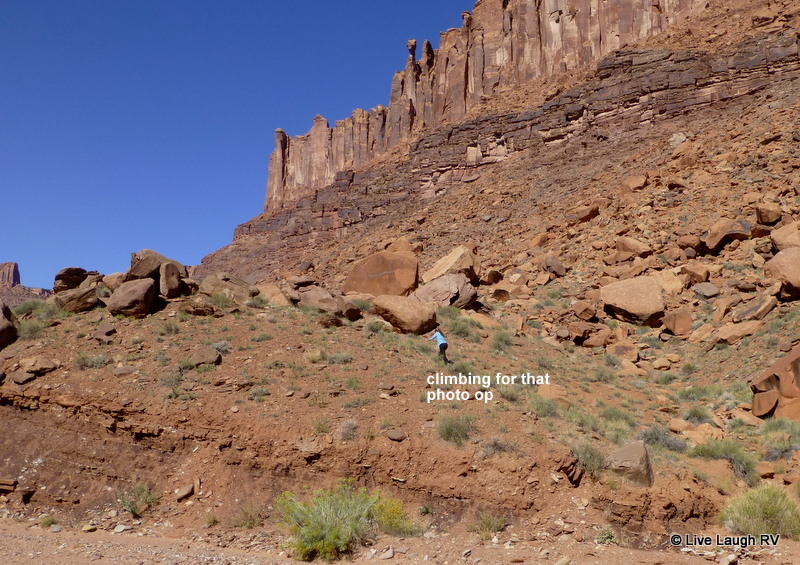 There were so many and some were fairly new to climbing which made you realize how hard it is. You saw the Jug Handle Arch! We missed it our first time out there. I can’t imagine living in an RV and not having a MacGyver. There is always something that needs repairing. Flexibility is the name of our game for sure!! Oh the things we do to get those great shots! Your photos are stunning Ingrid. I really enjoyed going on this search for you. Aren’t we lucky to have husbands who are so clever?. Yes, what would we do without these ‘clever’ guys? You have no idea how many times I stopped myself from getting into a precarious scenario for a photo op…..those ledges are a long way up and the drop a long way down! Wonderful adventures in a magnificent place. I am married to a very handy guy also, and it sure is a must for RVing, especially in remote places. Happy Travels! Your photos of the spectacular scenery are awesome, I so want to take the same drive! Pack up the Subaru, tent, and camera gear…. stunning scenery awaits! I do believe that UT is my favorite state because of its incredible landscapes! A handy man is a good thing to have around, and being a resourceful woman is essential!